Let me tell you, I'm so excited to share this recipe at Keepin' it Kind for Kristy's annual cookie swap, thank you Kristy for having me ! I look forward to this cookie swap ever year; amazing vegan cookie goodness all in one spot, what's not to love? 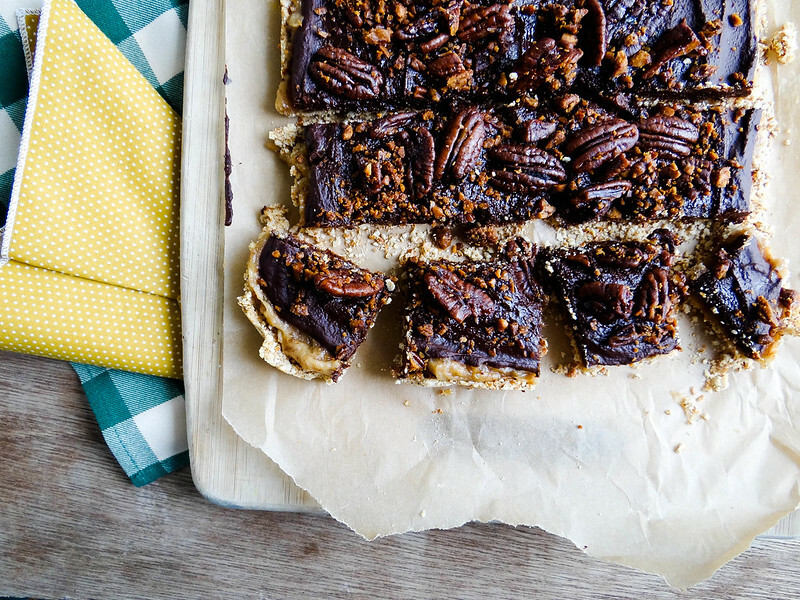 I also love that eating cookies for breakfast this time of year is totally socially acceptable....which I have definitely been taking advantage of this week, especially after making a batch of these cookie bars! 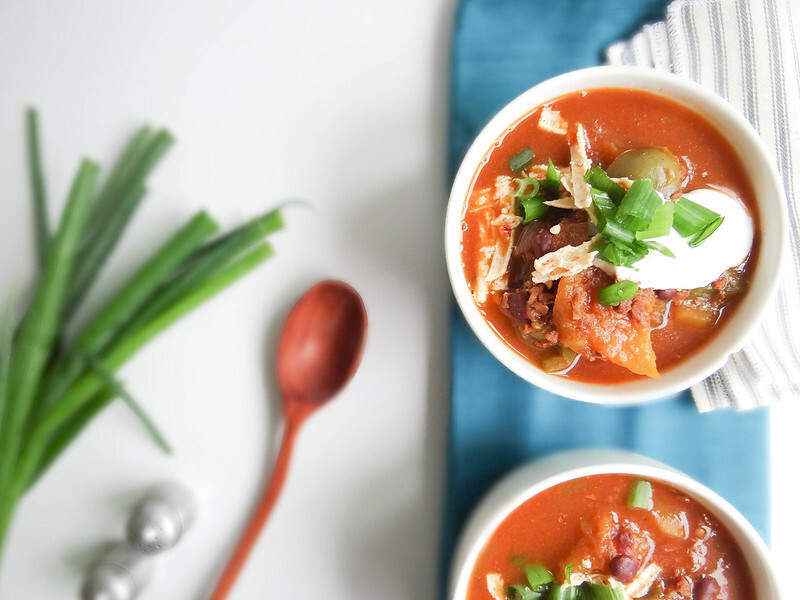 So head on over to Keepin' it Kind for the recipe! Today I have for you a very special post, I'd like you to meet an incredible person with one of the biggest hearts I have ever come across. Brooke is one of those people that makes you want to be a better person. She is a true inspiration and I am better person for knowing her. Today Brooke is sharing with us how one person can easily make an impact across country one small act of kindness at a time. When I was probably around 10 or so there was an amazing bakery located in a building that my Uncle owned, it was about a 10 minute walk or so to the bakery from our House. I remember the Baker/Owner was younger, had a wonky eye and always had on his floured covered white bakers apron when he greeted us. 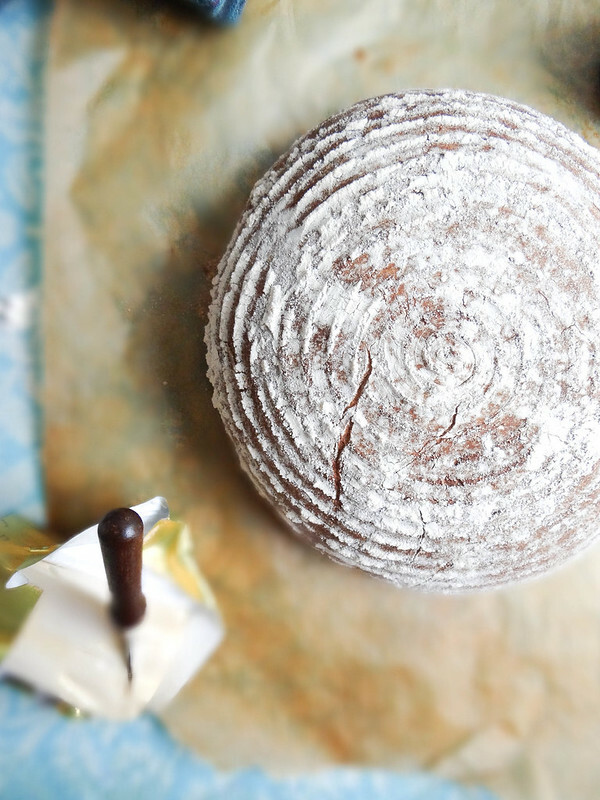 The one thing that stands out in this memory was his Anadama Bread- my Mom and I would make special trips to the Bakery just for a loaf of his Anadama. The bread was incredible and to this day nothing compares. My Anadama comes close, but its not the original from my Childhood memories. 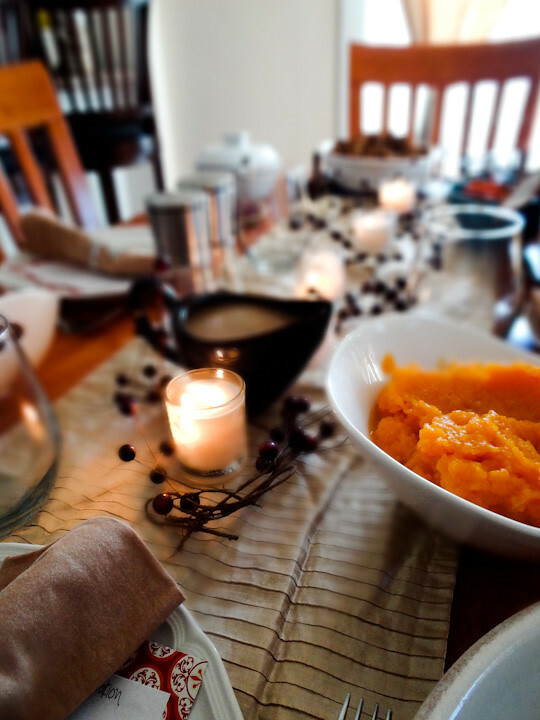 Thanksgiving is a grande event in our home - the day is filled with amazing food, incredible family, cocktails + games. It is the one Holiday that we stand firm on spending at home, of course our doors are open to anyone open to a compassionate Thanksgiving. Keep on reading for some amazing Thanksgiving Day inspiration! Thanksgiving is my all time favorite Holiday, I think you will find this true with most food obsessed people, it is an entire day of giving thanks and stuffing your face full of mouthwatering, carb loaded food, while wearing stretchy pants and not saving room for dessert but eating it anyway, then passing out in a food coma- sounds about right, doesn't it? 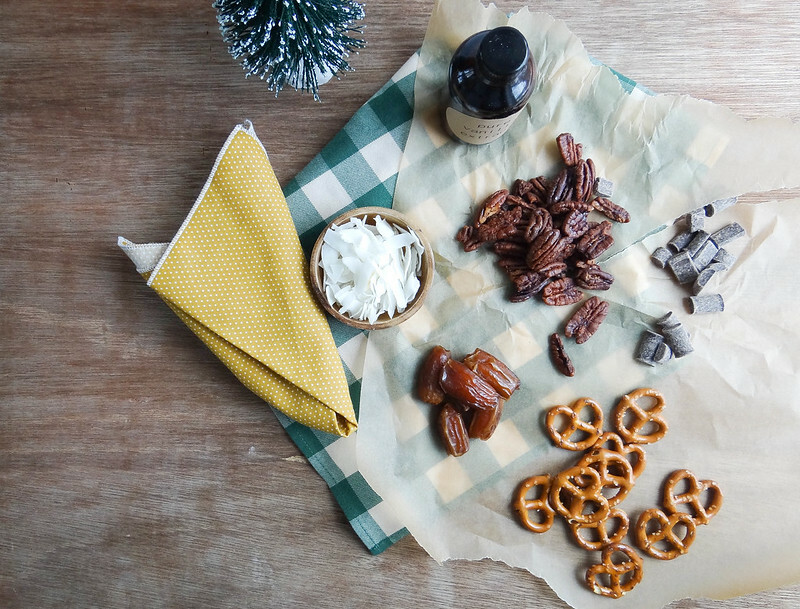 So it was a no brainer when NOW Foods contacted me to participate in their smart swap holiday challenge- creating a holiday themed recipe with a "health halo" using NOW Foods product. (with plain pecans, not honey roasted). My inspiration and creativity comes and goes- ebbs + flows. I can pick out patterns throughout my years of blogging and see where my creativity was at its peak during certain months and at other times not. Not only was this Summer incredibly busy I just never felt fully inspired, it was to the point that Justin was wondering if I had given up on blogging all together. My inspiration and creativity change with each passing season. This time of year is one of my favorites, it' just so happens to be the time of year I feel most creative. Regardless of the time of year, Justin and I love a good veggie burger. 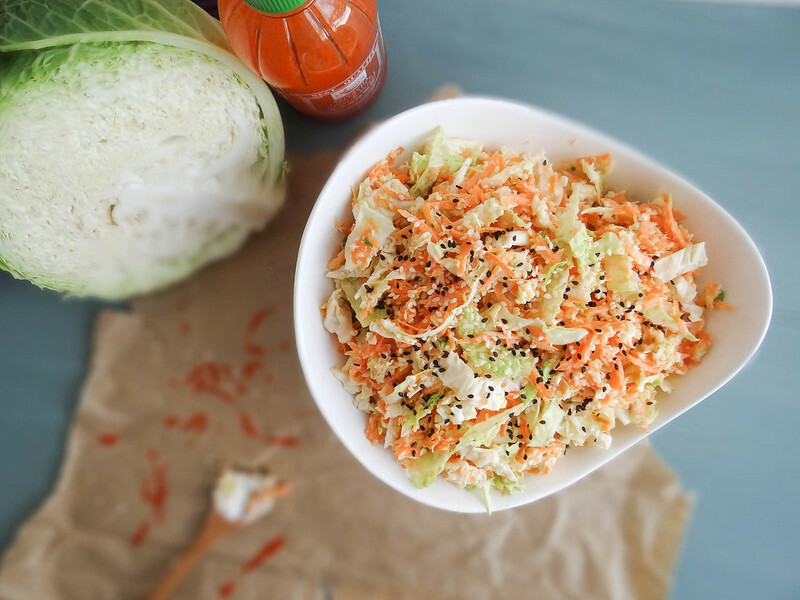 They are quick, easy and can be loaded with tons veggie goodness. 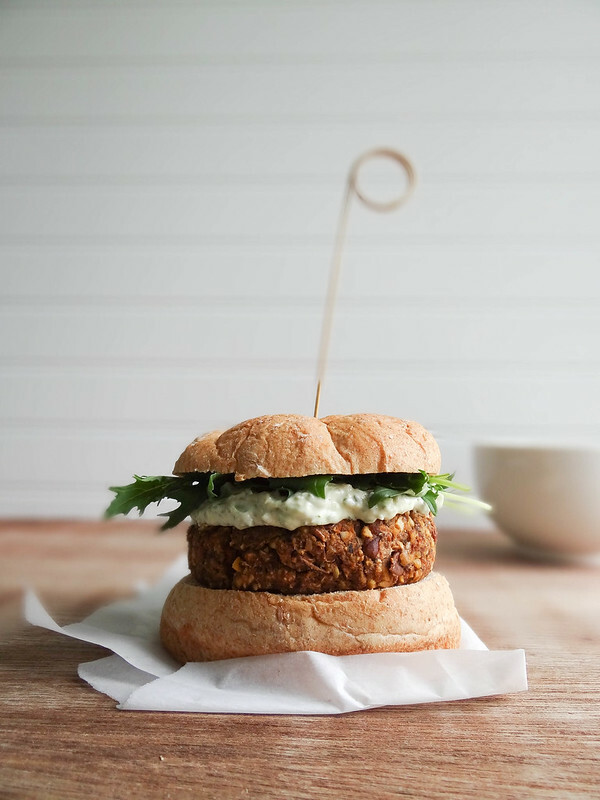 When it comes to veggie burgers the possibilities are truly endless - homemade veggie burgers typically freeze well making it an awesome mid week go to when you don't have time to "cook". 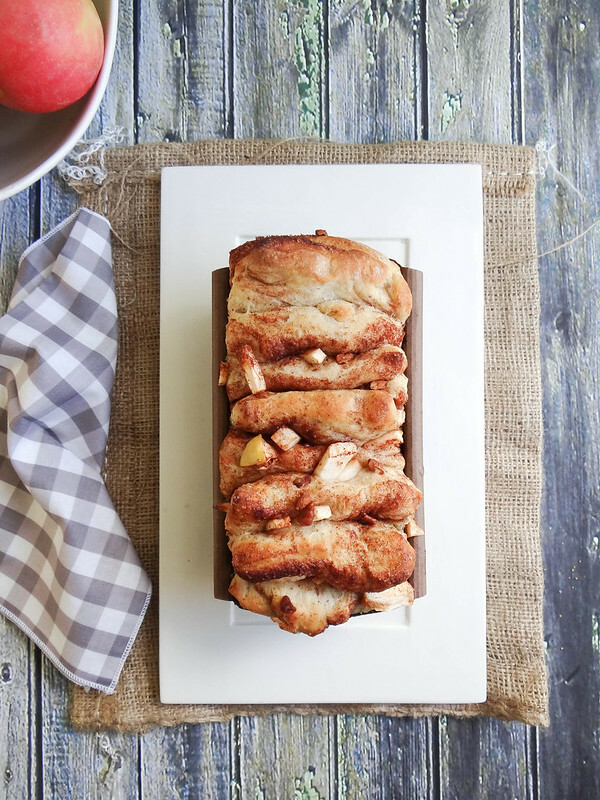 Make a batch over the weekend and freeze the rest to enjoy throughout the month. Iv'e mentioned a few times my love for savory pumpkin dishes and this one totally fits the bill in both savory + pumpkin departments. Apple Picking is forever a battle in our house- to simply put it Justin is not a fan of Apple Picking and I totally am, however he was totally into these tarts which is a rarity as he is not big on apples. Lucky for me, my Girlfriend has a weird boyfriend that doesn't like apple pie or any cooked apples matter of fact, but likes apple picking so she had a ton of apples for the taking. I was totally all over her offer when she told me she had some to spare! I had never experienced eggnog prior to meeting Justin, as I may have mentioned before, growing up we never ate anything that my Mom + Dad didn't eat- my Mom was a pretty finicky eater and my Dad's only real dislike are peas (even chickpeas!) + lima beans. Needless to say they were never on the eggnog band wagon. Justin on the other hand loved it! He introduced me to eggnog spiked with rum one Thanksgiving, I fell hard and fast in love with the slightly sweet creamy spiked nog.....for a total of one day. You see, we celebrated a bit early while I was cooking our HUGE Thanksgiving Feast, needless to say neither of us enjoyed our Thanksgiving Dinner on the day it was made, we were so full and pumped up on Eggnog there was no room left for anything else. When we became Vegans Eggnog, of course was out for the both of us. Until we came across Justin's favorite Holiday Beverage veganized! One of my favorite things about Autumn is Chili- big steaming bowls of spicy chili with a side of cornbread or tortilla chips. Our first bowl marks the start of the season and will continue on throughout the cold winter months- to say it is a weekly occurrence is an understatement , it is definitely a weekend tradition. 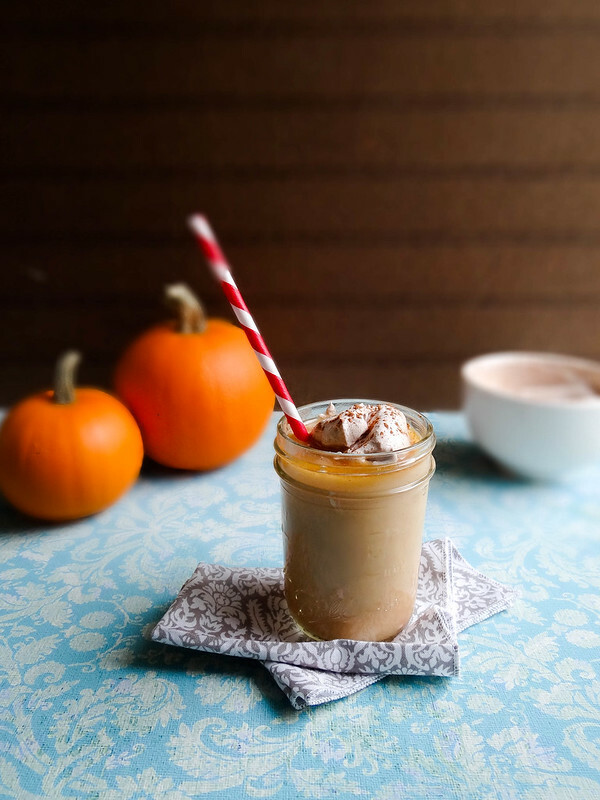 YAY for all things pumpkin! Bring cake into the picture and you have a winner. The frosting, well the frosting is a total game changer. Just sweet enough and oh so creamy; if you are not a fan of overly sweet + sugary frosting's this one is for you! 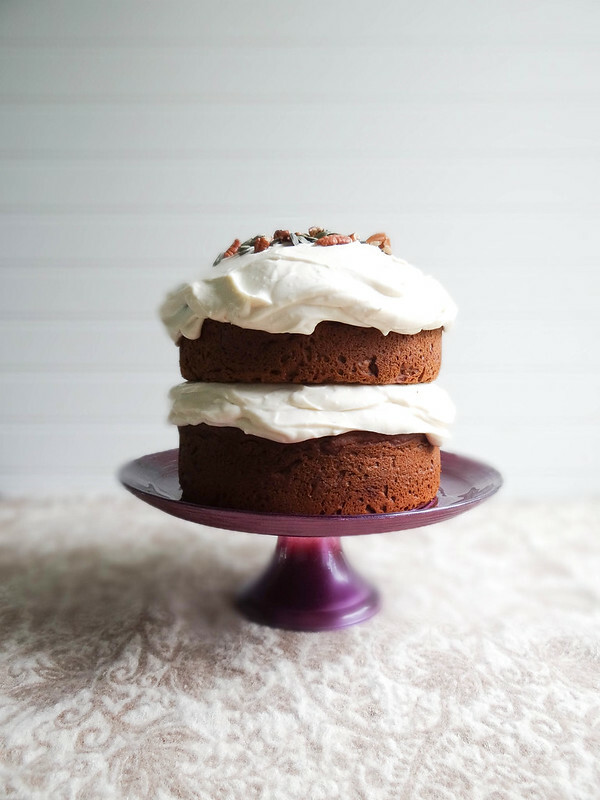 A super simple cake that looks really impressive- no joke, 1 bowl for the cake + 1 bowl for the frosting. Making just enough cake to share. I know what you must be thinking "Giiiirl you crazy, Summer's over, get yo'self some pumpkin"- hear me out, it haaaaas pumpkin seeds! Even though Summer is officially over my garden is still producing pints of cherry tomatoes, peppers and basil. 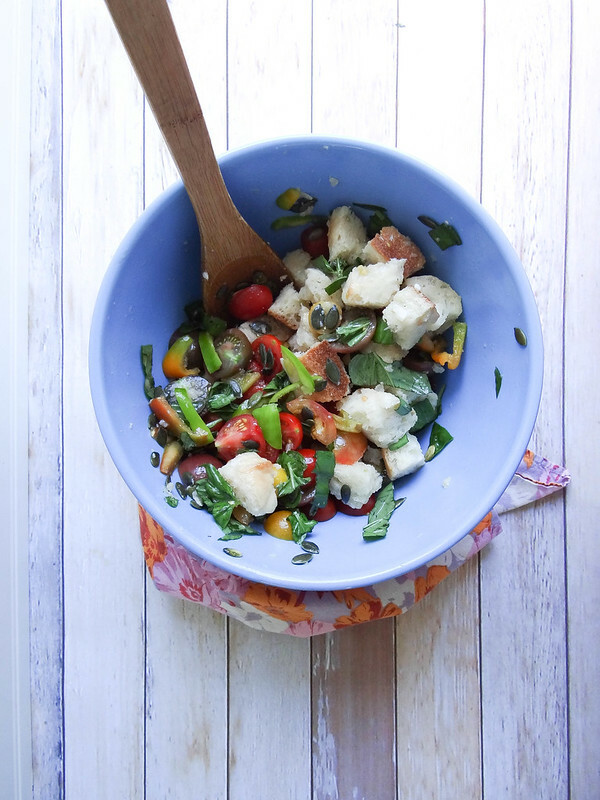 So, it's not too late to get on the panzanella wagon, with a little fall flair that is. Come on, bread, basil + tomatoes, what's not to love? For those who have never canned it can seem like a pretty scary undertaking. I won't lie, it definitely takes time, but scary...not in the least. 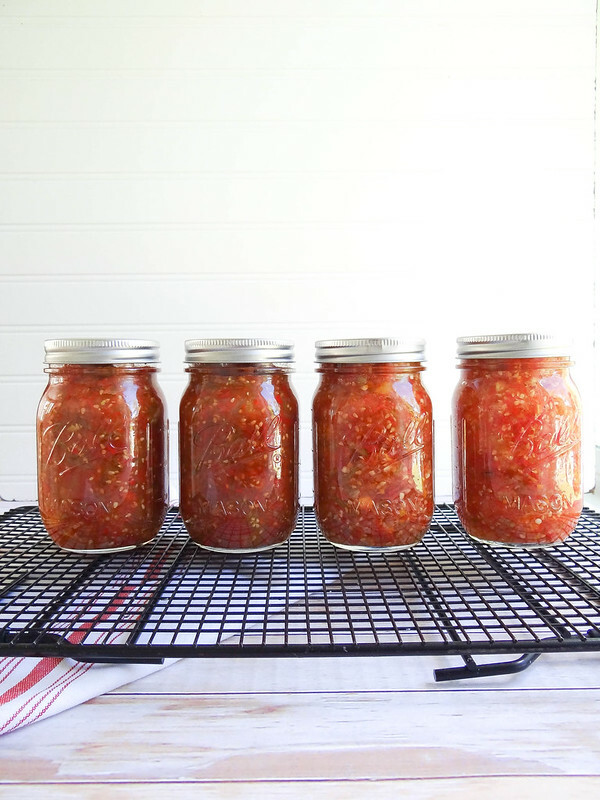 I have been canning salsa, tomato sauce, jams and pickles for about 8 years- once you have a few of the basics down, canning can be fun and a pretty seamless process. You only get better and more efficient with experience. Believe me, I have had Jam over boil on the stove top (not fun), scalding hot water down my arm and leg and a few other disasters- but they never caused me to give up on canning. Because there is nothing better than opening a can of jam or sauce in the dead of Winter that you put up yourself- you can almost taste Summer. Fall is officially here! Here's to comfy sweaters, tall boots, slouchy beanie hats, campfires + s'mores, everything pumpkin, apple picking and the beauty in the changing of the leaves. Hands down, Fall is my favorite season of the month- there is nothing I dislike about Fall. 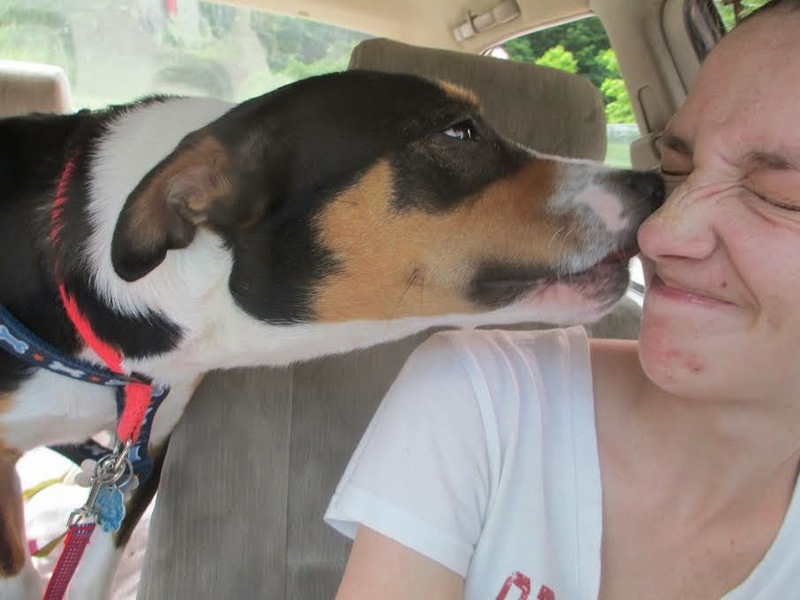 When it arrives, it comes in the form of a big long hug from a long lost friend. To kick off the Fall Season, I'm cranking on the oven and cooking up batches of granola, slowly simmered chilies + stews and canning up a storm. 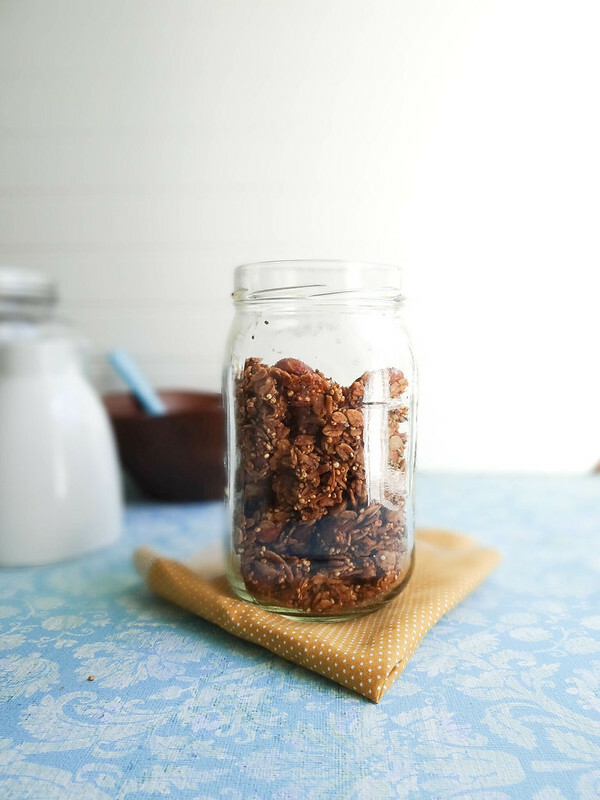 This granola is so , so good and super easy to put together , it also has the bonus of making your home smell oh so good. Okay, did Summer absolutely fly by for everyone else as it did for me? This year has been one of the busiest seasons at work that I can ever remember- full of transition, added responsibilities and lots of weekends worked. I truly feel like summer slipped through my fingers. So, here we are, at the end of the Summer and I feel as if I haven't shared much of my summer goodness with you. I hate to admit, the blog this summer has been terribly neglected. Honestly, the days I had off were simply spent eating tomatoes and fresh basil by the bucket loads, soaking up the sun and reading long novels. I am however, gearing up for an amazing fall season filled with all the delicious food comforts of Fall. 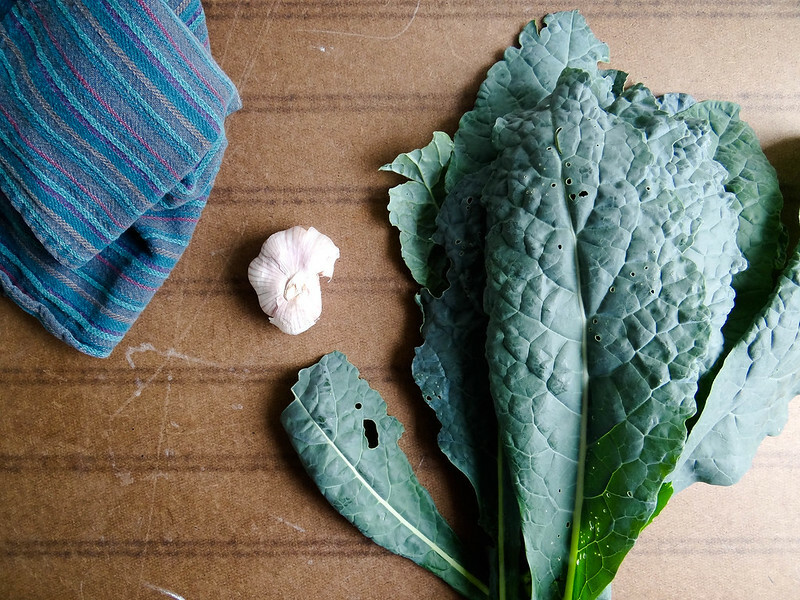 Along with copious amounts of tomatoes from the garden, I am drowning in bushels of kale. This has been one of my favorite ways to use up the never ending kale harvest- it is the green that keeps on giving Spring, Summer and Fall. One of my all time indulgences is ice cream- prior to becoming vegan I use to make homemade ice cream at least once a week. I still have not perfected the ultimate homemade vegan ice cream recipe, so I resort to store bought. Growing up I always passed on the birthday cake opting for a double serving of ice cream, when I did have a small piece of cake I love mixing it with my melty ice cream. It was a total game changer once ice cream cakes became popular, quickly my yearly birthday cake was an ice cream cake. So when So Delicious contacted me to sample their new line of sugar free and gluten free ice cream I couldn't resist. So Delicious has been a staple in our home since becoming vegan- ice cream and coconut yogurt are favorites, oh and I can't leave out the chocolate coated vanilla ice cream bars! My garden is performing amazingly well this year, the tomato plants are taller than I, baby butternuts and cheese pumpkins are sprouting up everywhere I look and cukes, kale, carrots and peppers couldn't be happier. However this year I do have one garden bed that is refusing to cooperate and it just so happens to be the one I planted first in early spring without amending the soil ( I got a little too excited the first sign of warmish weather I couldn't be bothered to take 1 extra step and add a bit of compost- lesson learned!) So far, this bed has produced a 1/2 cup of spring peas, I have planted Swiss chard on 3 different occasions and for the life of me I cannot figure out where the seeds and or/seedlings are disappearing too. I also planted (after I gave up on the Swiss Chard) a section of green beans and not one has sprouted. At least my oregano and Borage is pretty happy in this bed so I'm not at a total loss. It is hella hot this week- like 90 degree, hot & humid. The type of hot where even if your thighs don't rub together they are going to regardless of thigh gap. Working out is a hard, breathing is slowed and all I want to do is lay down in the middle of the yard with an ice cold sprinkler chasing over me with a Popsicle in hand. 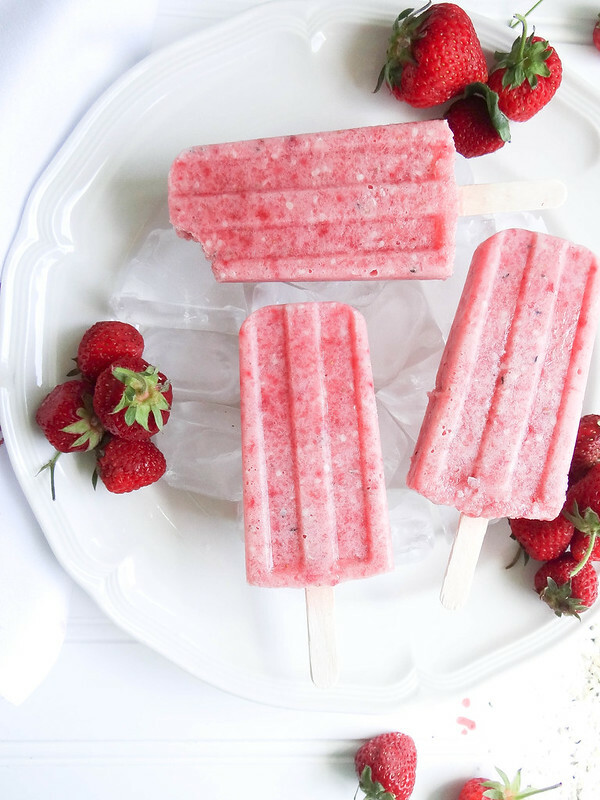 These Popsicles are pretty amazing- super quick and easy, make them in the morning and you will have a cold treat without even breaking sweat. During the summer month's, if I am not in the kitchen you are surely able to find me out in the Garden. When buying a house one of the most important items on the must have list was space for a garden. Ever since living on my own I have always found a little patch of dirt to call my own whether it was a dilapidated pile of dirt that need to be brought back to life, containers on a porch or window boxes. My first garden at my very first apartment (I was around 19 or so) was small but produced tons that first year- I even had a little rabbit from next door that would frequently visit (and steal a bite of squash or two), I remember running out in the pitch dark after getting word about the first frost settling in that night to collect the tomatoes still ripe on the vine. Can you believe how quickly June is flying by? It feels like yesterday I was getting pumped for non dairy month, planning what to wear to Matt & Mitzie's wedding and gearing up for the 30 day ab challenge. Amazingly the wedding was this weekend & fabulous! I am heading towards the 100+ sit up mark in the challenge and this is my last smoothie post for non dairy month. I originally had another recipe planned for non dairy month- Peanut Butter Waffles to be exact. However I had a few pears in the fruit bowl just begging to be put to good use. 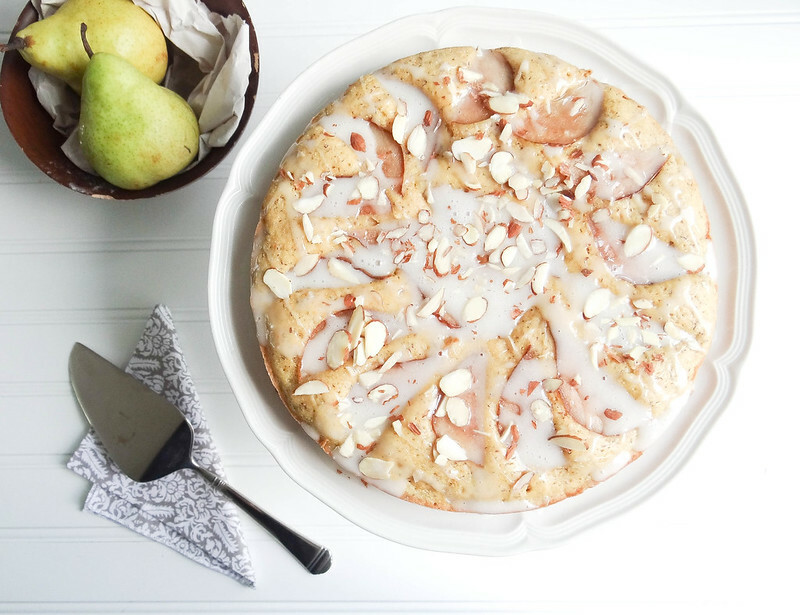 I wanted a super simple cake with big vanilla and almonds flavor- thus, this cake was born. There are few things in life that I love more than chocolate chip cookies. 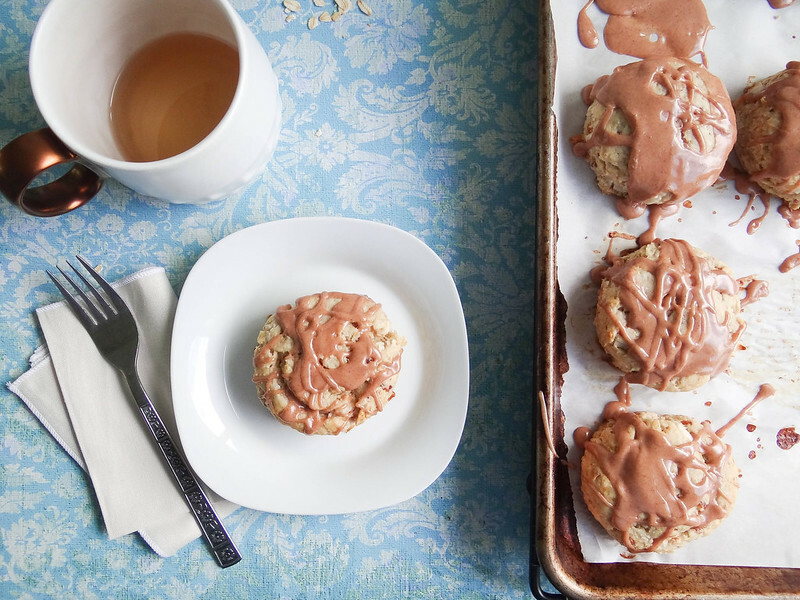 These are by far my favorite, the added oats give you a boost of fiber and the dark chocolate sea salt almond chocolate is a game changer – these are a must make on a Sunday afternoon! When Justin bought me my Kitchen Aide Mixer our deal was I would make him chocolate chip cookies once a week...needless to say I don't make chocolate chip cookies once a week, maybe once a month if he is lucky - making them a little less often makes us appreciate them a little more plus I am still able to fit into my jeans- that is a very good thing . We are half way through Non Dairy Month- how crazy is that! 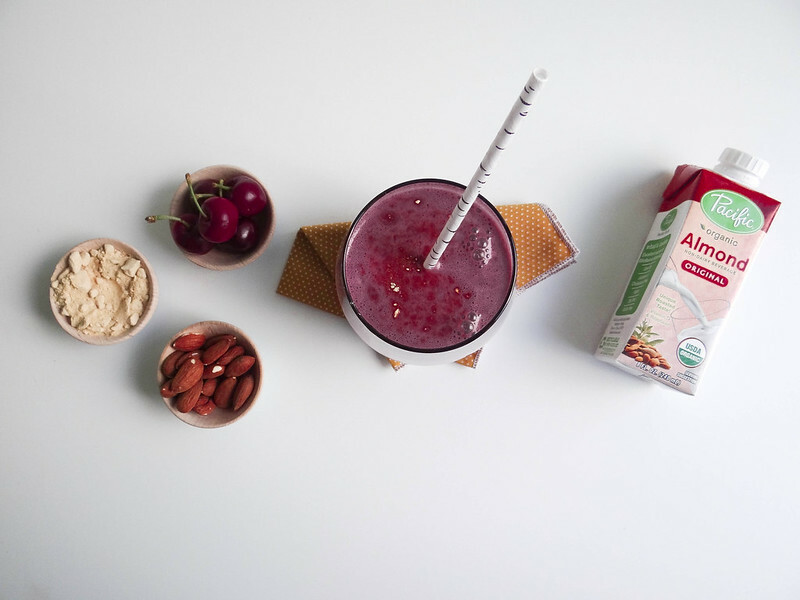 This weeks smoothie features 3 of my favorite things: almond milk, cherries and maca- total goodness in a glass. 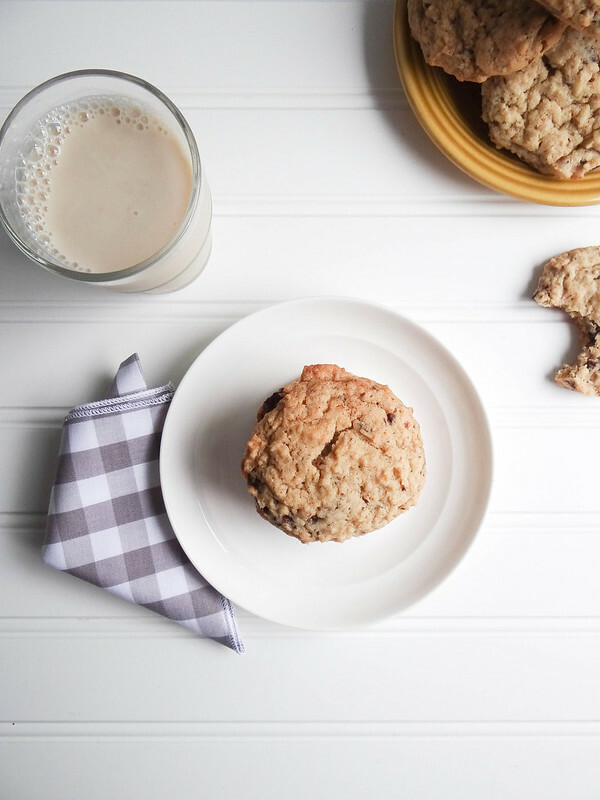 Almond Milk is our go to milk for everyday drinking and baking. 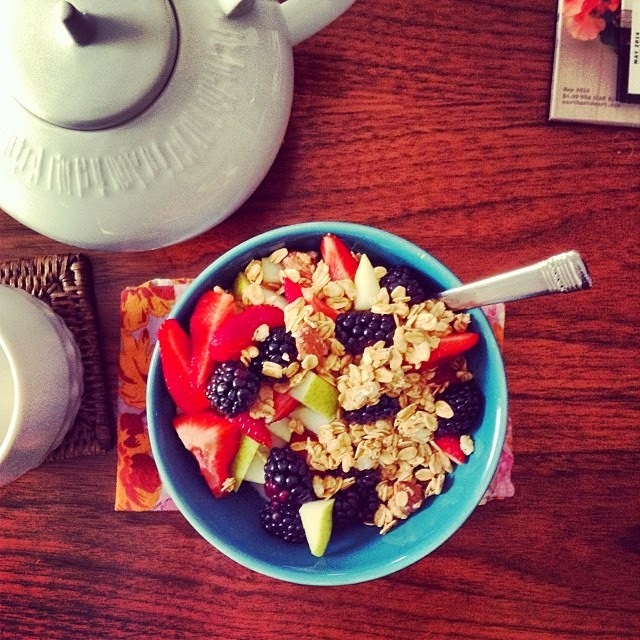 Nearly every morning during the work week Justin has a couple bowls of cereal drowned in Almond Milk. My Mom, who isn't even vegan or vegetarian has replaced her coffee creamer with Almond Milk - this stuff is good, no lie. Puff Pastry can be a lifesaver in the dessert making department- easy to use, readily available & bakes up fast in a totally impressive way. Normally I have a few sheets of pastry in my freezer, you do need to think ahead a bit in order to defrost the pastry prior to using. I like to pop it in the fridge overnight so it is ready the next day. 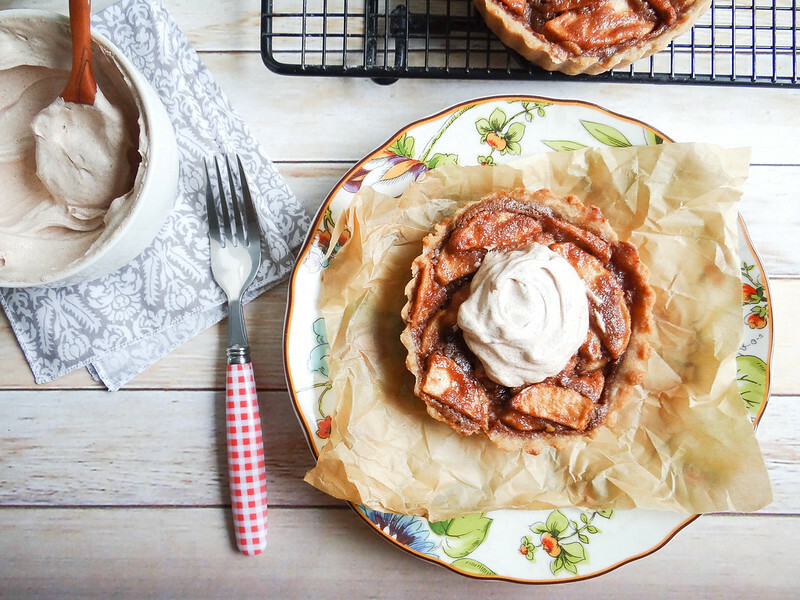 I was in need of a quick dessert over Memorial Day Weekend; who doesn't love pastry and fresh fruit? 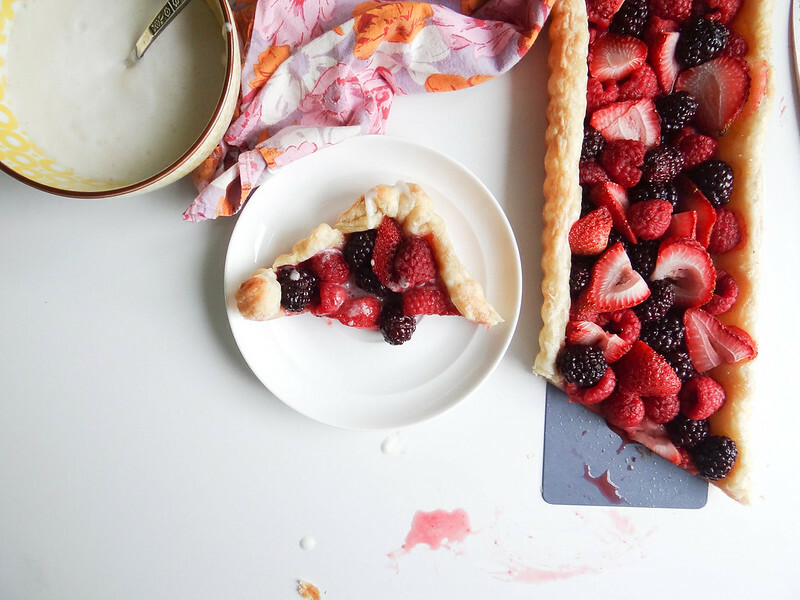 This tart would also fit the bill nicely for 4th of July. I don't make scones very often, but I had a super craving for scones and a cup of tea a couple weeks ago and couldn't get the idea out of my mind. There was only one solution- makes scones! Keeping in theme with non dairy month, these beautiful little scones are made with Pacific's Organic Oat Milk. They turned out even better than I had imagined- you will want each and every last crumb. Out of all the non dairy beverages out there, oat milk is totally new to me. 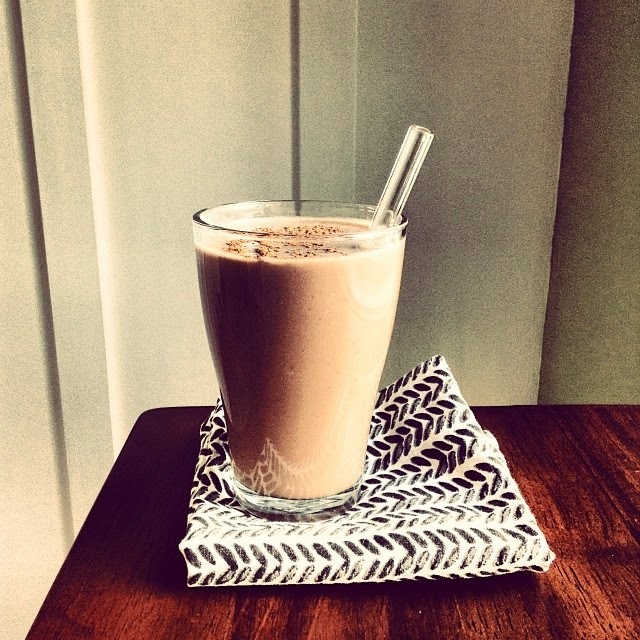 I was taken back of amazing it tasted, truthfully I was a little apprehensive at first- oat milk? I had it stuck in my mind it was going to be gritty and grassy- boy was I wrong! 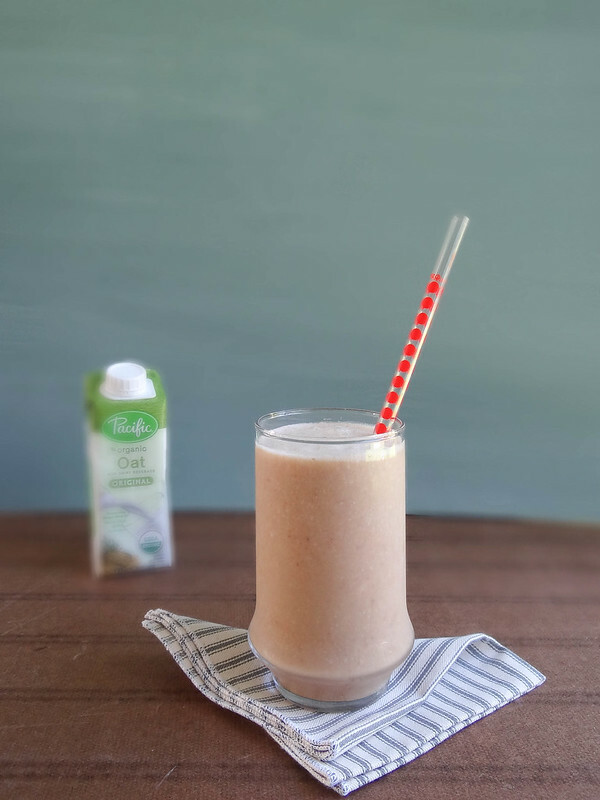 Oat milk is quickly becoming a favorite - just a tad sweet and totally silky smooth, making it the perfect non dairy milk to add to my morning smoothies. Justin and I consider pasta salad the first rite of summer - admittedly we are known to bust out the first pasta salad of the season a little too soon...okay, really early, like at the first sight of a robin or when the temp hovers around 60 degrees and the day light stays with us until 7:00pm. We are like Snow White singing and dancing with little birdies surrounding us in the backyard at the first sight of warm weather. Oh glorious day! We feel free and can't get enough of the warmth from the sun- then it rains for the month of May and we are catapulted back into the reality that we shouldn't have packed away all of our cold weather clothes. Spring, she is a funny lady- she gives us a taste and then takes it away. It's like taking a bite of an awesome cupcake after a fast and then having someone take it away before you have even finished chewing. 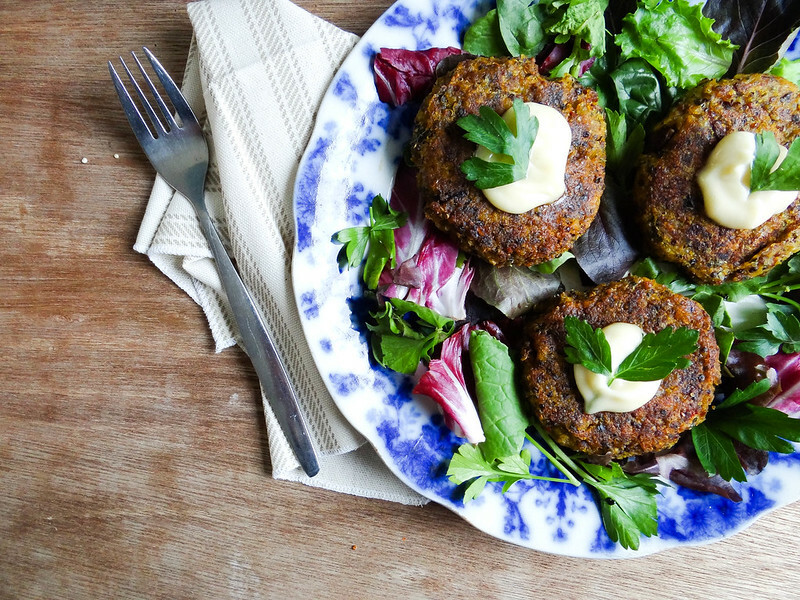 Veggie burger + falafel = a party in my mouth. Kid you not, this is one of the best veggie burgers I have made to date. 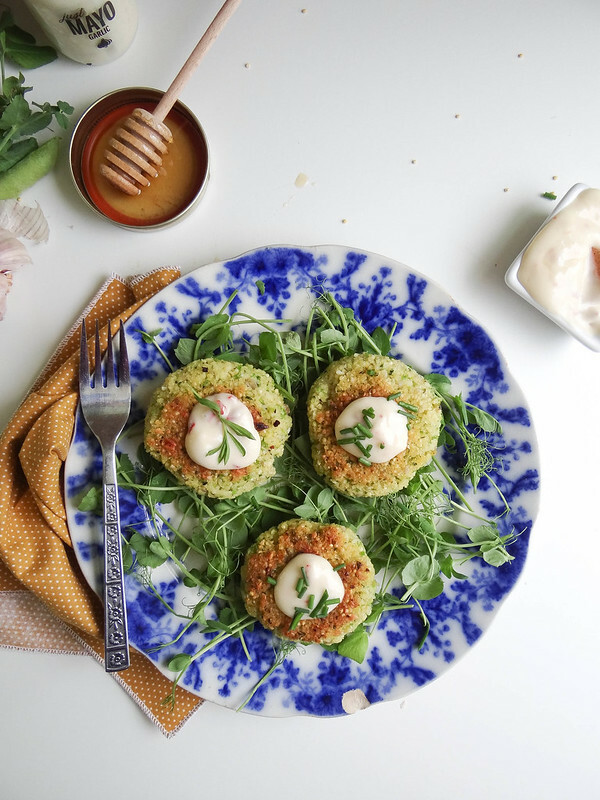 Crunchy on the outside and just right on the inside (aka not dry) and holds together incredibly well without the need for any fillers such as rice, oats or bread crumbs. 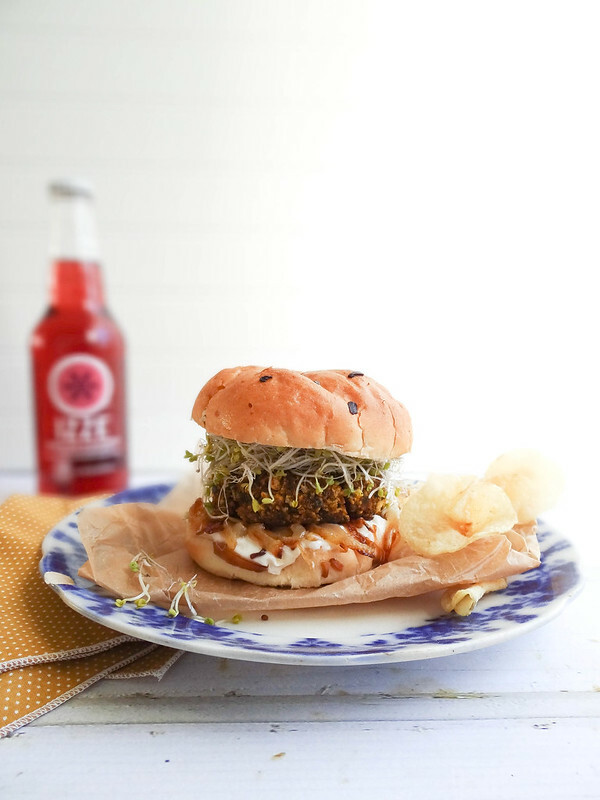 This is a straight bean and veggie burger with flavors of falafel and the middle east- I can't say enough about how good this veggie burger is. I am willing to bet these would hold up well on the grill but have yet to experiment on an open grate grill. only a tabletop outside grill griddle and they cooked up perfectly. It is rare to see a giveaway or a sponsored review on this blog, come to think about it this is a first. Over the years I have had several companies reach out looking to sponsor a post or send along a product for review, however none of them ever felt like the right fit. A few weeks back Pacific Foods approached me looking to see if I would be interested in participating in their non dairy month during the month of June; I jumped at the chance! First I love Pacific's line of vegan products and have been a loyal customer for several years, secondly I love the fact that there is a whole month dedicated to promoting dairy alternatives. 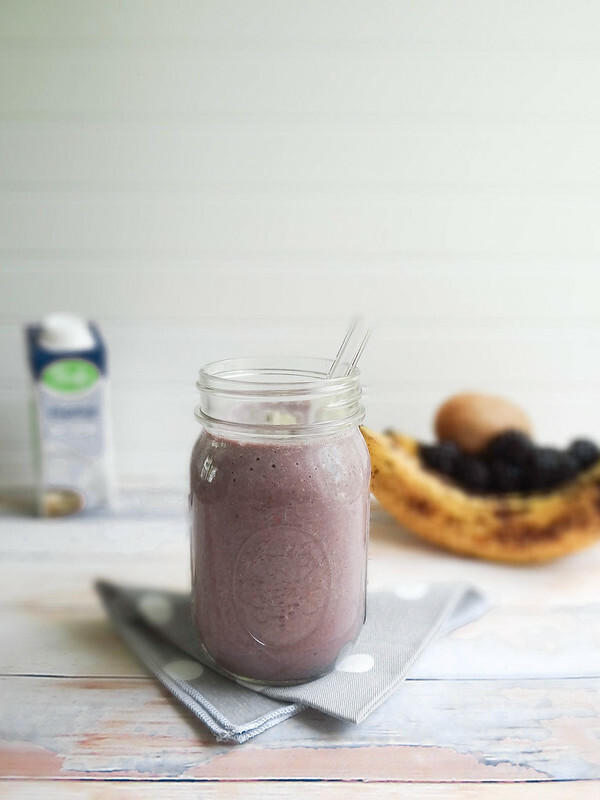 Each week I will be featuring a smoothie and recipe featuring the non dairy beverage of the week. 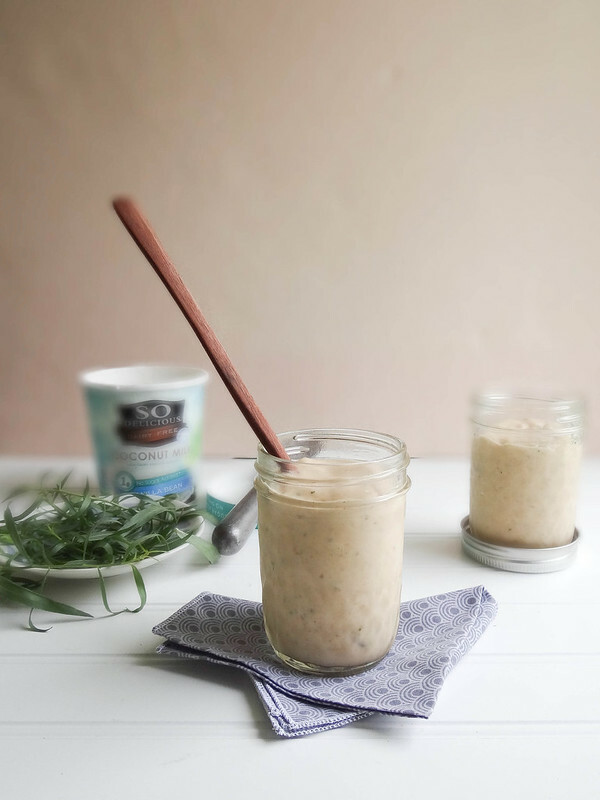 This week let me introduce you to Hemp Milk, which just so happens to be one of my favorites! The Garden is off to a slow start this year - one day we are blessed with clear skies and 80 degrees, the very next day 50 degrees and rain. The silver lining- the herbs and greens are doing amazingly well! A few years ago I added perennial herbs to the Garden- perennials come back year after year without and poking or prodding from the gardener needed. They are the first to sprout up, giving your garden life once again. 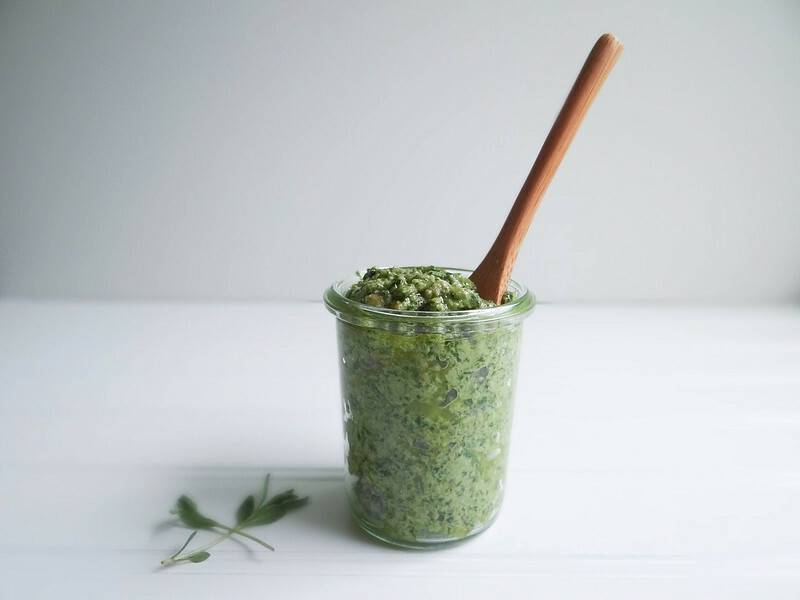 This pesto was inspired by my garden herbs; chives, tarragon, thyme, oregano & winter savory. The beauty of this pesto is the ability to use any herb growing in your garden- throw in some greens too if that's what abundant in your garden. 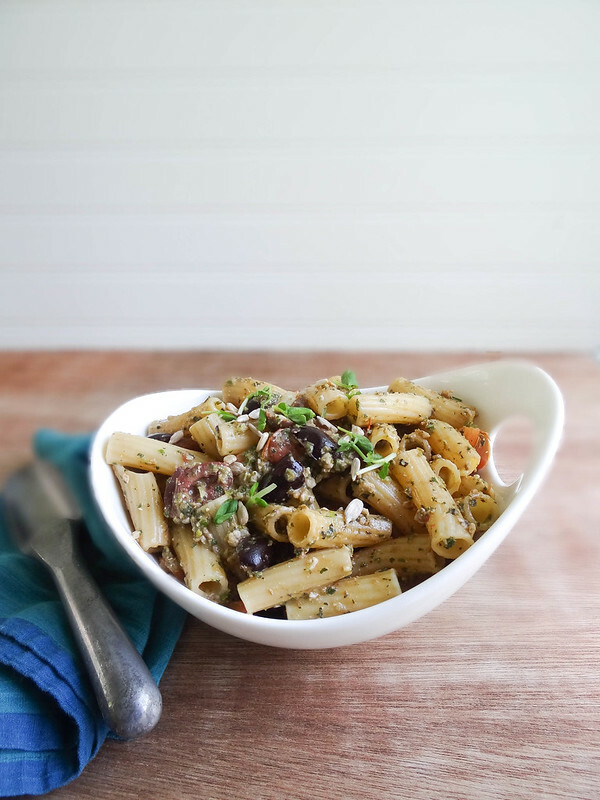 Sunflower seeds are used in place of the more traditional pine nut, making this nut allergy friendly and a little more frugal than a traditional pesto. My days have been so all over the place- I am serious lacking motivation in the blogging department and need to find some inspiration and motivation. The beautiful weather and warm days are partly to blame along with the garden constantly calling my name. I love day dreaming about all the goodness that will be coming from the garden within a few short months, I was lucky enough to snap off my first asparagus spear for a quick mid morning snack out in the garden- I never knew asparagus could taste out of this world...the one I grew did and only took me 3 years for the first taste. I have a slew of amazing recipes in my Que waiting to be made and photographed beautifully.....I am hoping this coming Sunday will be a day of baking and creating. Until then, here's what I've been up too these past couple of weeks- enjoy! Spring is here!!! I have been spending most of my free time in the garden; prepping the soil, planting carrots, peas, beets, chard and sunflowers, and taking care of my little seedlings. Things will be a bit quiet around here recipe wise, I am shooting for at least 1-2 new recipes per week for the blog during the month of May, after such a long winter I want nothing more than to be outside in the sunshine. It finally feels like spring! That means quality time with the garden- we are getting to know one another once again, seedlings, yummy breakfast bowls & alfresco dining in the backyard. Summer I am so ready for you. I totally go through food phases. Currently, I am obsessing over tofu scrambles, I can't get enough of fresh spring rolls and tacos have become my new best friend. 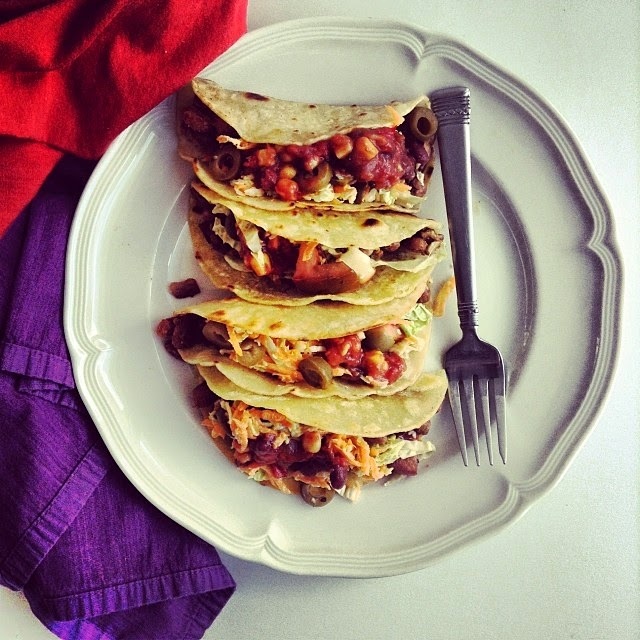 I have a feeling these tacos and I will be BFF's for a very long time- they totally make me *swoon*. I am finally getting around to a spring garden post- this post in picture form, has been sitting in my Que for far too long. One thing after another has prevented me from putting my plan into action; we ordered new lights for the grow house (awesome lights, so worth the wait! ), the snow just barely disappeared and my work/life schedule has been full of craziness! 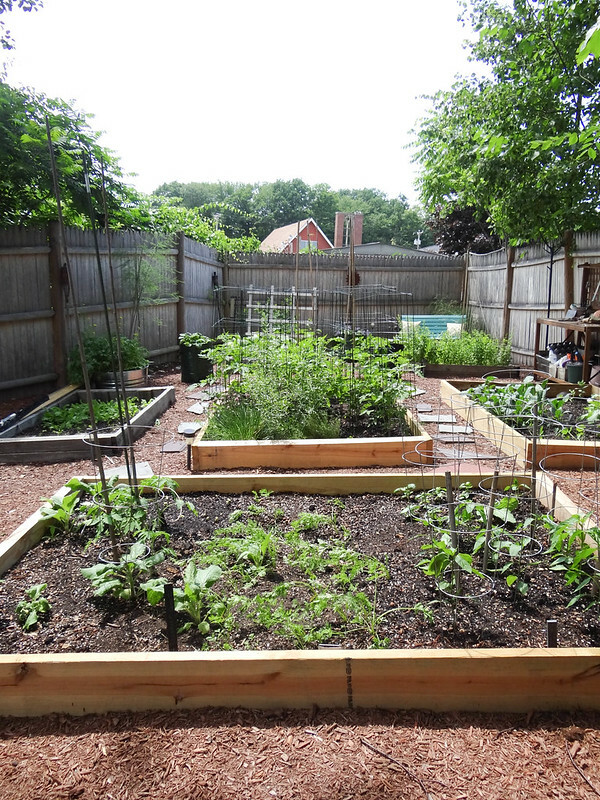 So want to start a garden of your own? 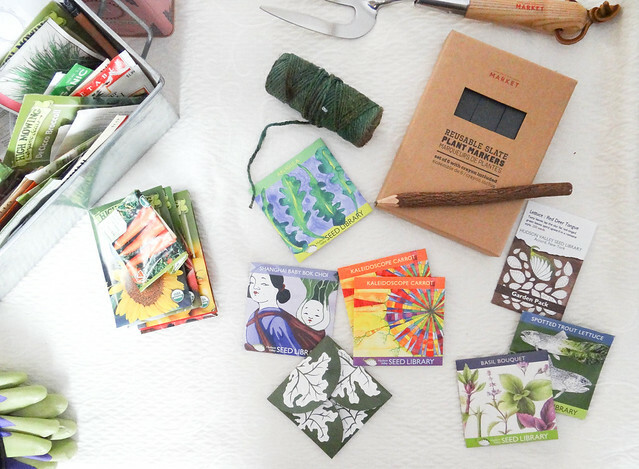 It only takes a bit of planning, seeds, soil, water & loads of light - today I am going to walk you through my garden planning process. Spring is finally here! Well sort of- last week, kid you not we had one 70 degree day and the very next day the thermometer read 28 with a dusting of snow. This time last year my garden was cleared, spring peas were sown and we were enjoying grilling out nearly every night- this April not so much. My garden is still a wreck, nothing has been sown and we have resorted to bringing the BBQ inside. 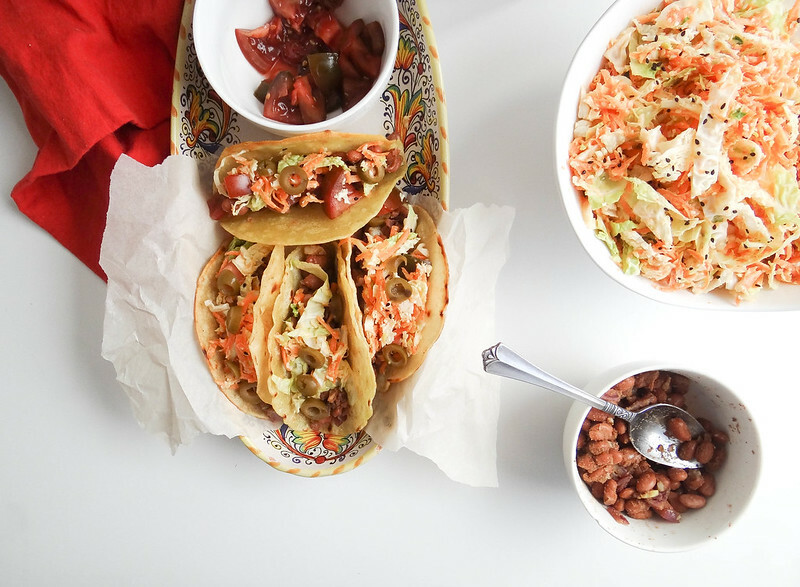 I absolutely love a good slaw alongside vegan brats & beans, tempeh sliders are generously mounded with the stuff and lately I can't get enough of this slaw stuffed inside my tacos. This week flew by, I noticed that most of my weekly recaps rotate around food and a orange cat named Spencer. Once the garden has thawed expect tons of gardening pics- we are experimenting with our AERO garden and Baby Bok Choi and should have some progress pics to share soon! I fell hard and fast in love with this bread. 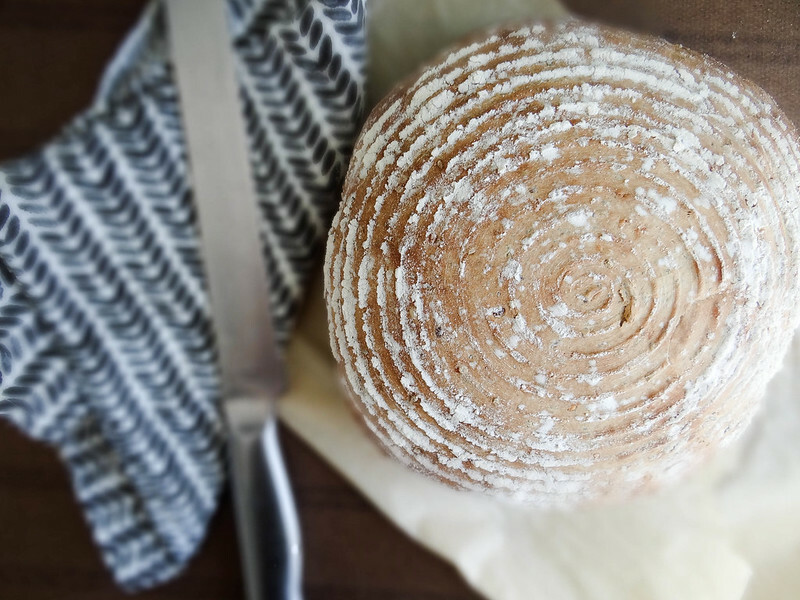 I mean I love all bread, but time after time seeded, crusty, rustic bread steals my heart. I want to eat this bread all day, every day no exceptions. Not only does it taste amazing slightly warmed slathered in orange marmalade or butter but is also makes a pretty incredible grilled cheese & panzanella. 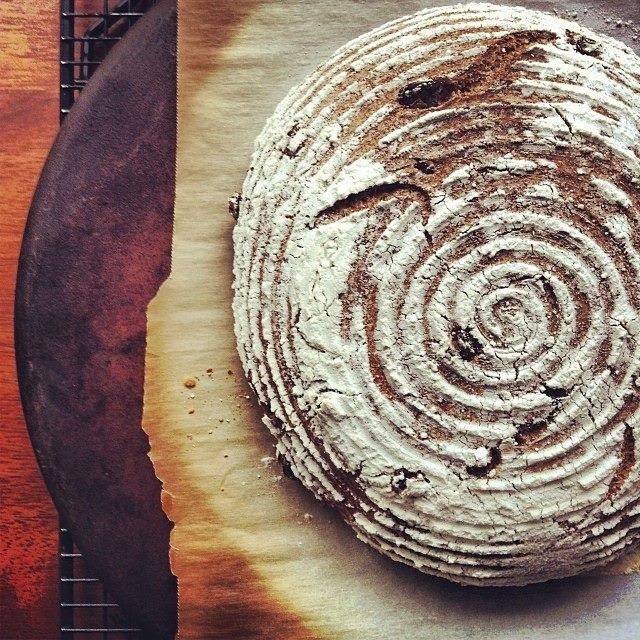 Oh rustic seeded boule, if I was stranded on a dessert Island with the choice of only five things to eat you would be my number one, right alongside sweet potato, avocado, peanut butter & blueberries. Justin and I recently completed a three day Juice Cleanse designed by Jus by Julie- there was a pretty awesome deal on Groupon so I snapped it up in a hurry. I have done juice fasts in the past but have always gone the homemade route. Honestly, having the juices shipped to me and ready to go was pretty amazing and a total time saver. 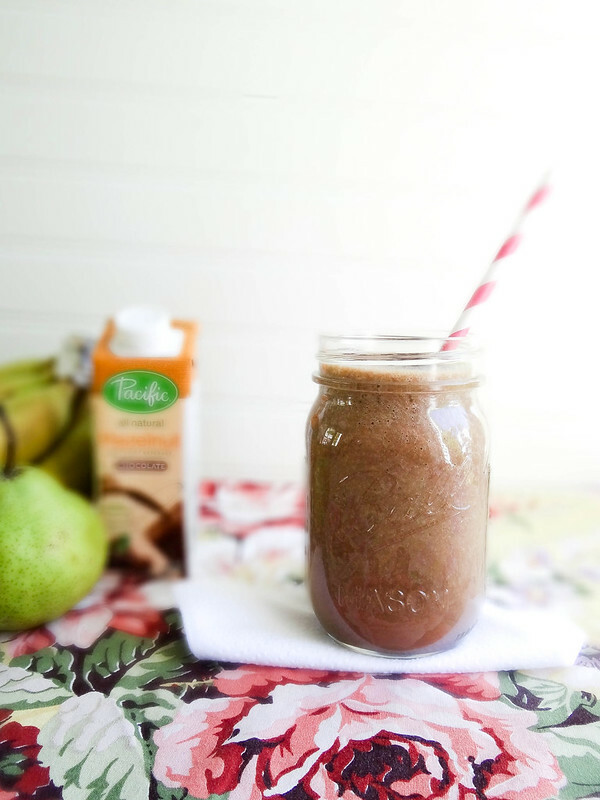 Many of the Juices can be easily recreated at home- two of my favorites were Peanut Butter Banana & Island Coconut. 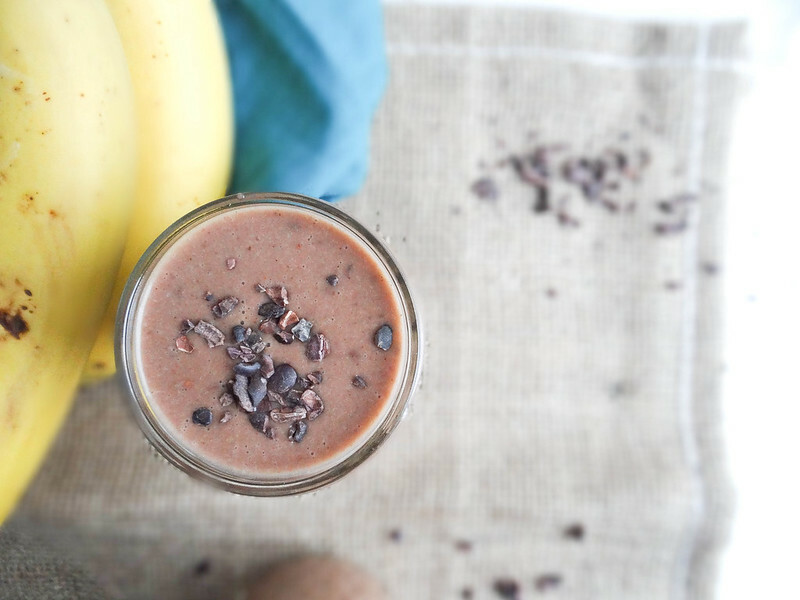 This is my version of the Peanut Butter Banana- let me tell you, it is totally addicting! I love looking back through past posts to see what I was inspired by each season - it gives me a chance to take note patterns and ingredients that I am drawn too. 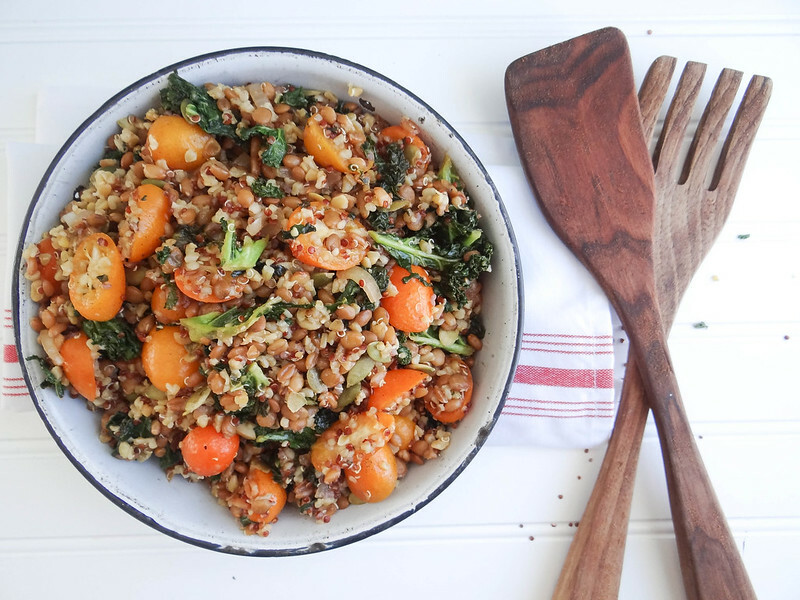 For example, during the late winter, early spring I focus a lot on breakfast, hearty grain & greens based salads, spring rolls and citrus along with loads of desserts. This year you will find the same pattern in the archives; breakfast, salad, spring rolls, citrus and sweets - I may have mentioned in a recent post I'm pretty predictable. I have always thought of this time of year as very transitional relating to locally sourced food - most of our Winter Markets are closing as they need to focus their energy on the upcoming growing season, so I find myself scouring the supermarkets for seasonal fare. Citrus season is upon us and I plan to take full advantage of this beautiful season- starting with these little orange, full of happiness kumquats.